The INKOMA – PK-coupling is a machine element designed to transmit torque between shafts having large parallel displacement or off-set. The magnitude and direction of this off-set can be varied during operation. Each movement at the input end is transmitted, without loss, to the output. 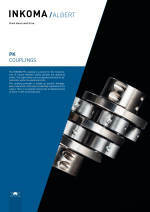 The INKOMA – PK-coupling transmits torque without any radial loads on related bearings. The INKOMA – PK-coupling is dynamically balanced and absorbs radial vibrations. The INKOMA – PK-coupling requires very small space for the parallel displacement accomodated, when compared to the traditional cardan arrangements.